The Up with People 2019 Gala was an absolute success. From people’s participation in the paddle raise to an outstanding performance by the Up with People cast, the night was one that we will all remember. 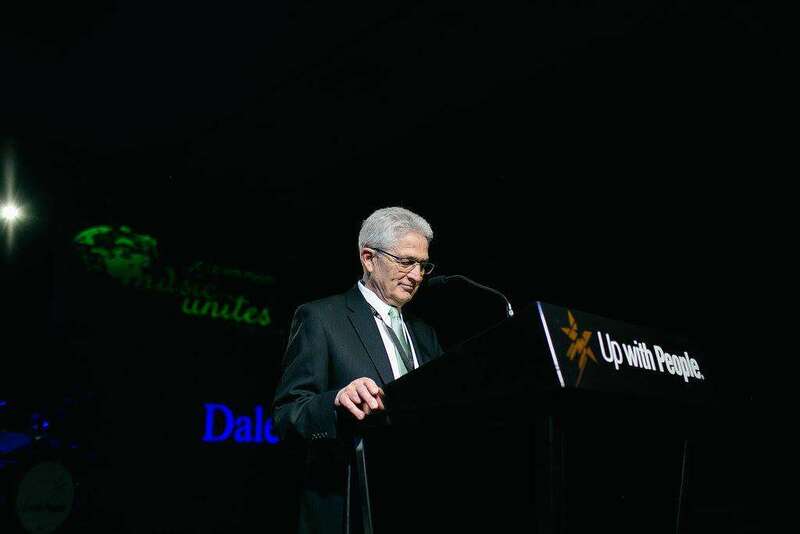 Up with People’s President and CEO, Dale Penny, kicked off the gala by sharing his remarks with the audience for those that attended as well as those watching from home on our global live stream. “I’m aware that we have two audiences here tonight, those who have been involved deeply in the Up with People program and know a lot about it, and those who are here as guests and know little about our programs. So let me take a brief moment to say a word about Up with People. The short story is that Up with People is an organization founded during the 1960’s, another time of great global division – a time when most people were defining themselves by who and what they were against. At a summer youth conference, the founding question to the students was, “We know what you are against. What are you for?” Their answer was a world with empathy and inclusion and dignity and respect for all. And the way they chose to address the divisive issues of the day was through music, and celebration, and optimism for the future. Since then over 22,000 young people have travelled in the casts of Up with People, with more choosing to share this experience every semester. And today we are continuing to evolve, serving more and younger youth to increase our community impact. In addition to the traveling cast program for young adults that you’ll see this evening, we have two rapidly growing youth programs. Up with People Jr., a day camp for kids from 8 to 12, and Camp Up with People for teens 13 to 17. The impact of all of our programs goes far beyond the participants. It touches their families, the host families they stay with, and the communities they serve. Soon, we plan to offer programs to up to 15,000 youth and young adults in 100 cities worldwide each year. It’s an exciting and important time for Up with People to extend our reach. It’s not that we share a single race, we clearly don’t, or one faith, or a nationality, or political affiliation. It’s not our age or our gender or sexual orientation or what we think about some pretty fundamental social issues. No, I believe what draws us together is an idea that goes back to that summer conference. That what we share is greater than what divides us and we can overcome our differences to build a common future together. I know that sounds too simplistic, too naïve, too Pollyanna-ish, but it is at the very core of Up with People and I think it is why we are all here tonight. It’s not that we are oblivious to the ugliness, the fear, the incivility and divisions in our world. It is simply that we have made the choice to be optimistic and hopeful rather than give in to despair. Rebellious, daring and vital. Those are adjectives rarely used about Up with People. But from the very beginning 53 years ago the cast members of Up with People have had the audacity, the gall, the daring to face the cynics and “…declare what needs to be in the face of what is” and then to turn that hopeful declaration into action. And they do that not just during their time in the program. They continue to be that community of positive change agents throughout their lives in their communities and professions. And many of those are in the room tonight. That is what we are celebrating tonight and that is why your being here and your support is so essential to keeping this organization thriving and enabling young people to raise their rebellious, daring and vital voices and declare a world that needs to be, and can be if we keep up the fight. “It begins with us, will you stand with us? It begins with us, it won’t end with us!